Woburn,MA-June, 2010--Shenitech is proud to announce immediate availability of the ST302 Solar-Powered Ultrasonic Flowmeter. 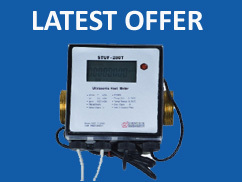 Shenitech is proud to announce immediate availability of the ST302 Solar-Powered Ultrasonic Flowmeter. Our real-time/embedded engineers are expertise in programming those devices in the most proficient manner with a variety of support software and development tools, such as network stacks, real-time operating system (RTOS), etc. At Shenitech, we offer turnkey solutions. We develop, test and debug the software according to a specification approved by you and we deliver the fully documented source code and test result documentation at the end of the project. Besides, Shenitech also has the management experience and a well-defined development procedure to bring your product in on time. We believe that up-front preparation, careful engineering, and thorough project and risk management are the best ways to protect your investment. We work with our clients to ensure that their whole product is a success, even if we only write the software. It is this system-wide approach that catches problems before they slip through the cracks, delaying delivery and costing more in design.